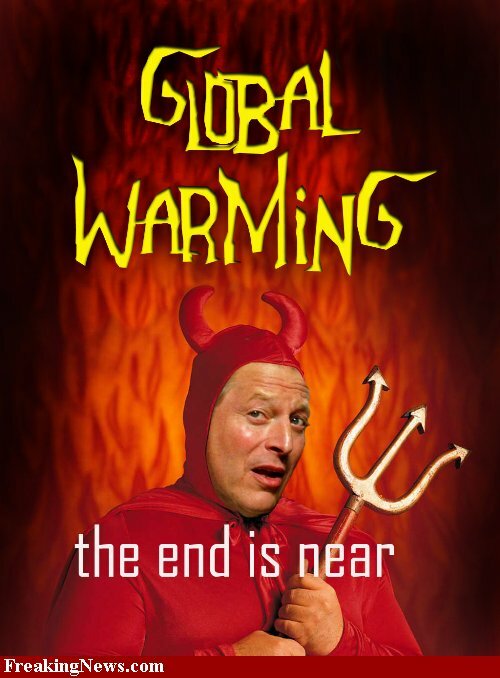 Al Gore, High Priest of the enviro-socialist movement to restrain trade, cripple economic growth and massively increase financial burdens on capitalism in general, has convinced many millions that the sky is falling and death and destruction will be the fate of billions if the doctrines of the church are ignored. Film at 11. The Church of the Searing Orb, or as congregants love to refer to the planet, “Mother Earth”, has established a stronghold with an otherwise doubting public. Considering just 32 years ago, when Newsweek printed an expose’ claiming ice would overwhelm humanity and scientist’s proposed a blanket of coal dust be spread over the polar ice caps to aid in melting thus saving humanity from the oncoming ice age, thing’s sure have changed fast. Now, with the latest round of propoganda, the Church has big plans for the fallout from an easily duped public, honing in on the special human need to feel morally superior. Corporations, beholden to customers to buy products and fearing public boycott, have readily given access to the enviro-extortionists, providing partnerships with publicly owned companies and forcing submission to social and economic changes that no one in America voted for. While global warming has wide support from some scientists and even the illiterate, the junk science has been cleverly hidden in plain sight. Exaggerations must be overlooked when the salvation of mankind is in the balance. Gore has had virtually no challengers politically primarily because dissidents may be characterized as unfriendly to bunnies or polar bears or might “offend’ the worshippers of the earth godess. Young people across the globe, weary of chanting “Bush is a Nazi” and “Death to America” readily warm to this new, feel good, universal socialist project. Even by radical estimates, at most 3.5% of global climate conditions can be , if you stretch it a little, attributed to human action. That means 96.5% of the time, people are so small and insignifigant, nothing we do will change a thing. Nothing, except maybe nuclear war. Also, a new term is being used to describe the phenonomon: climate change, usefully moving away from catastrophic images to the minor alteration of the earths average temperatures that historically take place, saving face for scientists who forecast the big one that never came. Considering basically any actions taken by humans might, or might not, effect a tiny percentage of global conditions, and that in the negative, that is the effort produces a result measured by what DOES NOT happen, ( statistically undetectable annual climate change) and that in 50 to 75 years (imagine issuing statistics about the weather decades in advance) just how did this become the predominate issue for enviro-worshippers? One answer is the Chief Priest Al Gore. He wrote “Earth in the Balance”, insisting the world was rapidly approaching destruction and requiring the removal of the gasoline combustion engine. You know, like the one in 99% of cars. Then, with an eye toward funding subordinate proselytizers, he starred in a for profit docu-drama explaining, on an eighth grade level, that the end of the world is near and the time for repentance is now. Movies are powerful things. You sit in the dark, eating a comfort food, relaxed and available for the message. Undivided attention. Willingly submissive. Your whole mindset is “Tell me the story.” Be careful what you submit yourself to. Unfortunately, pop culture icons are difficult to overcome considering worship of such in America is rampant. And, if you saw it in a movie, separating reality from fiction requires an effort most are unwilling to make, especially if it’s supposed to be fact. Since most make no attempt to educate themselves beyond radio and the visual media, entire belief systems are gleaned from pop music, TV and movies, for better or worse. Environmental worship seems to say little about the character of a person iIF you believe good intentions outweigh the means to achieve them. It does speak volumes about fear and how easily injected into real life it can be by a semi-cartoon. 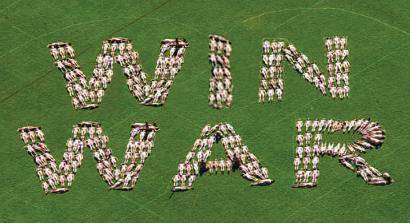 Americans want to win this war! I don’t want to embarrass anyone, but I thought it was worth the risk to show you just what a group of committed people can do. Despite what you may see on television, there are those who care desperately about the outcome of the struggle in Iraq against the enemies of America. This group went a little further than the average citizen by posing for a dramatic color photo with their bodies forming a wonderfully encouraging message to Americans wherever they may be. There are many ways patriotic Americans can serve their country without using a deadly weapon and these folks have risked itchiness and sunburn at the least to make this bold statement. What are you doing to further the defense of the nation and to what lengths would you go to support those involved in the actual fighting? Is there any truth to this cartoon? Will this cartoon spark riots and destruction throughout the Islamic communities of the world? Will anti-Israeli politicos cry foul and demand retraction? 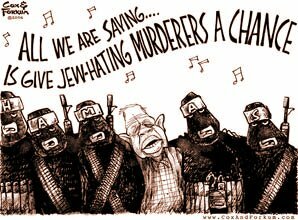 Will anti-semites insist on firing the perpetrator of this obvious hoax? Will you ask yourself why this mans best buds are in Cuba, North Korea, Venezuela and Palestine? Will you ponder why 14 associates of this man resigned from his foundation? Will there ever be a day when this man will publicly debate his new book and answer critics about misstatements, fabrications, false analogies and plagiarized materials contained therein? Will you ask yourself: if you recieved millions of dollars from multiple middle eastern nations, including the Saudis, wouldn’t you tend to favor their causes? Will anything this man does ever make up for being on the wrong side of history for the last 30 years? Will you let your mind wander to a time when there isn’t a former American president wandering the planet, advising and comforting third world police states and terrorists? 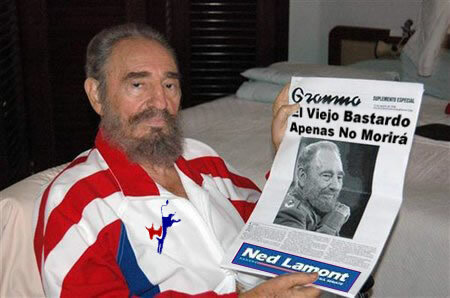 Disgusted with the ouster of his pick for United States Senate, Cuban leader Fidel Castro has elected to choose a new Democrat candidate to root on to power. With John Kerry abstaining, the field is still flush with potential supporters, all awaiting the blessing of El’Commandante’. The ailing communist dictator, currently recuperating in Spain and under the care of Spanish doctors even though Cubas socialized medicine is the finest in the western hemisphere, is expected to announce his choice soon. And it had better be. In other related events, a source close to the most courageous human being this side of Jimmy Carter, let it be known that Castros brother, Raul, will lead the glorious revolution upon his demise. Miami Cuban exile groups have pledged to resist the urge to retake the island paradise after Fidel succumbs to his illness, preferring to lure His Excellency’s brother Raul into inviting them to restore the nation to it’s former pre-Fidel elegance. Michael Corleone has been solicited to act as agent for the aging, now mostly wealthy,exiles. Unlike Mexico, which receives massive cash payments from the US, Cubas economy is bouyed by sugar, nickel, tobacco, and tourism, although not American tourists, and despite decades of glorious collectivist economic policies and state control of it’s economy, as well as really swell auto mechanics keeping it’s antique collection of Chevys, Packards and Edsels running, Cuba finds itself desperately in need of cash flow. On an economic high note, just not for Cubans, Che Guevara t-shirt sales are brisk in the US. The Maryland Institute College of Art, whatever that is, called the photo used on the shirts “the most famous photograph in the world and a symbol of the 20th century.” Ouch. Despite a state controlled planned economy, and intense wage/price controls and government rationing of goods, and a current 22% unemployment rate, the authorities hold faithfully to existing policies, blaming America for any problems they may be having. Losing the massive aid from the former Soviet Union may be a tiny factor as well. Dan (fake, but accurate) Rather once called the Cuban Premier “Cubas own Elvis!” “It’s a shame Fidel never made any records” lamented Mr. Rather, “the government could have made a bundle and then redistributed the wealth accordingly.” Probably not. The peoples path to utopia has been slightly trampled by otherwise well intentioned comrades, with the islands inhabitants only needing everyday staples to complete a well rounded life such as jobs, homes, schools, freedom of speech, free press, to assemble and so on. A small price to pay for an opportunity to establish perfect Marxist harmony and equality among the masses. Upon the establishment of a democratic state, the economy also faces the release of thousands of political prisoners which will have an effect, as yet undetermined. Americas’ ban on some trade with the communist island oasis may be lifted once free Cubans regain a say in policy matters and the prospect of free elections are realized. Only time will tell just where negotiations will take relations with the US and it’s hoped the vote will return self respect and confidence in government to the Cuban people. Another failed Marxist/communist/socialist regime? Certainly. Viva’ la Cuba!! Imagine all the people, living life in pieces. Imagine sending your child to kill others and themselves. Imagine there’s no Heaven, except for terrorist martyrs. 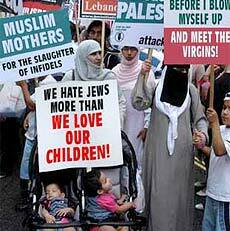 Imagine no nation on earth willing to fight this sick cult of death. Imagine your being spared because your an open-minded, multicultural, tolerant sweetheart. Imagine you had a brain. I apologize for using the international anthem of America Haters worldwide in producing this post. It just seemed to work. The term liberal has been hijacked. The term used to mean one who acted in an openhandedly generous manner towards his fellow man. A liberal thinker sought to free himself from convention. Creativity and tolerance were paramount and leniency regarding judgement of others for humility’s sake was the order of the day. And in the rare case, it still does. Nowadays, the term has been applied to the extreme ideologues who leave the above definition in the dust. Modern liberalism more often denotes radicalism, unconventional attitudes and unorthodox behavior. I’m never shocked anymore when any Supreme Court nominee is presented to the Senate, the candidates position on abortion is the very first thing pointed out. Always. I’m also perplexed that anyone would think redistributing wealth was a good idea, especially when it’s somebody elses dough. I’m pleasantly surprised when liberal politicians support any attempt to defend the nation, and not surprised when they change their minds. I’m dissapointed when attempts are made to cover up a hidden agenda wrapped in a feel good cause using children as bait. I’m amazed at the recent tendency to discard stalwarts of the liberal cause for the new kid on the block. I’m baffled that the short sighted, pandering and appeasement avenue is always the route of first choice. The great word liberal has been stolen, and radical “progressives”, secular humanists and those with a penchant for totalitarian attitudes like “shut the hell up, you idiot” do this wonderful term an incredible disservice. Against the war, for the troops? Ever wonder why American born, American raised elected officials, trusted servants of the people and defenders of freedom, justice and the American way would threaten to cut off funding for the American military in a time of war? Ever wonder why these same stalwarts of truth and liberty would sign anything even remotely hinting at anything less than complete, unwavering support for the men and women who fight and die to preserve the nation?